Earlier tonight, the broadcast of The Daily Show was briefly interrupted by a blip of stock war footage, a spinning ballerina, and a web address with a Russian domain name. The internet quickly assumed that the late night comedy show had been hacked. It wasn’t. If that’s not obvious enough, a quick look at who owns the domain name shows that it was registered on March 29th by Viacom, Comedy Central’s parent company. Haha, you get it? It’s hilarious because Russia and hacking and Trump. The Daily Show has been in a bit of a creative slump since Jon Stewart left and this little stunt reeks of desperation. But aside from it just not being funny, it’s also irresponsible. I hate to go clutching my pearls here but we have a really screwed up environment right now when it comes to this legitimate issue. Stuff like this isn’t helping. Xenophobic responses to all things Russian are bad. The fact that the left is taking every new nugget of info as gospel is bad. The fact that the right is dismissing the issue is bad. And the fact that the House investigation into the matter has become a joke is bad. All one needs to do is look at Twitter to see that a lot of people will just make their assumptions, let it feed into their paranoia, and never look into what the hell really happened. 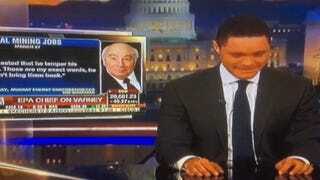 So yeah, The Daily Show/Viacom did something stupid. You can see it below. Russia Hacks. They Just Don't Hack The Daily Show.